The beautiful Dubols half-tonner “The Alchemist” was owned by the commodore of the Island Sailing Club of Cowes, UK. During the “Round the Island” race, the skipper hit the wreck of the SS Varvassi, leading to a rescue operation by the RNLI. Watch as this sailboat sinks with the White Cliffs of Dover in the background. 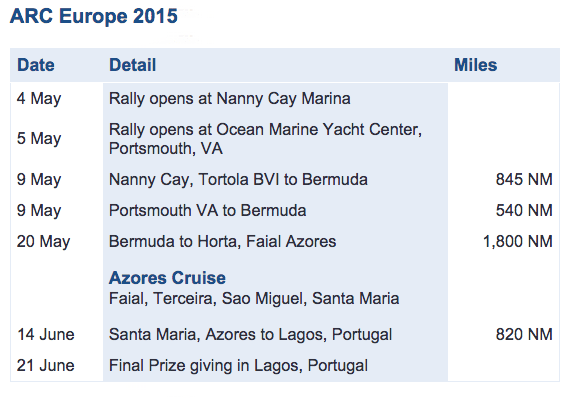 World Cruising Club’s transatlantic rally, ARC Europe 2016 begins! Thirty-eight boats have left the BVI’s and are heading to Bermuda before continuing across the Atlantic ocean. A majority of the vessels have less than twenty nautical miles between them. A distance that is outside VHF radio contact but only about four hours travel time if assistance is needed. Communication takes place via satellite-phone-based devices that also transmit a GPS location to the club’s base camp and an online map for the friends, family and fans to enjoy. 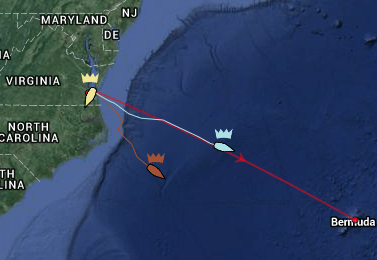 Also there are just three cruisers that have started their rally from Virginia. That’s where Lindsay and I plan to start with Makara next year. As you may recall, we had planned to be a part of the rally this year. It didn’t take long after purchasing Makara in December and sailing her down the east coast to realize that we didn’t have enough time to prepare for the open ocean by April. We have decided to sit this one out at the Historic Sea Port of Key West, Florida for a year. Watching the ARC Europe 2015 rally on the “Fleet Tracker” was helpful in making a decision to purchase a catamaran over a monohull. Last year, a Leopard 48 sailed (and probably motored some, too) faster than ALL OTHER BOATS in the rally, both monohulls and catamarans included! It’s important to note that this was only during the DOWNWIND leg, however it is the longest leg. The catamaran was not fastest was the wind was coming from the beam (the side), while travelling between the BVI’s and Bermuda. 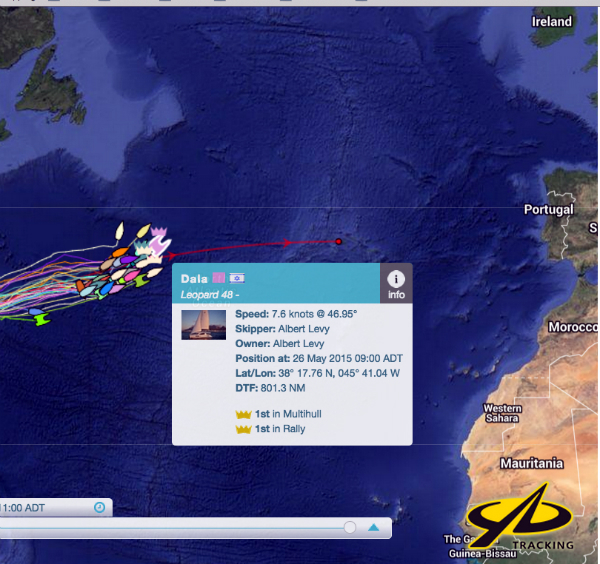 Here is a screen shot from last year showing skipper Albert Levy in the lead at the halfway point. 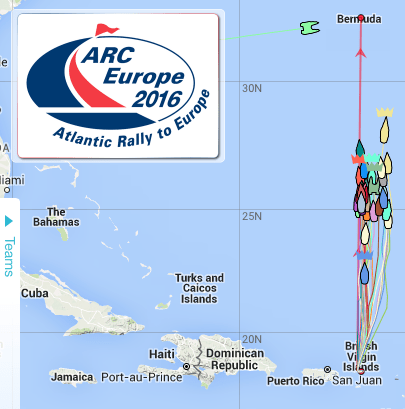 That lead was maintained all the way to the Azores. I was impressed by Robertson and Caine’s Leopard catamarans from that point on. I started my search for used Leopards and found Makara soon after! Makara is 47 feet long, so I will be cheering for both of the 45 footers this time! I will wait for the downwind leg, however…..
Old boat to future boat: “Third Aye” versus a 2005 Leopard 43, comparing layouts of two very different boats. There was just enough headroom for me to walk upright and not hit my head on the “domelight” in the saloon, which looked like something from my first car in high school. 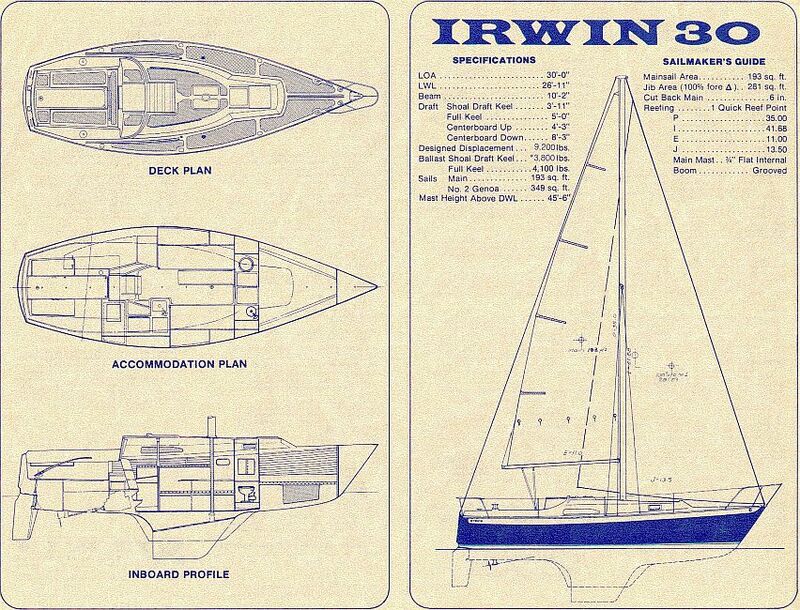 As you can see from the “accommodation plan” and “inboard profile” below, the boat is pretty much divided into thirds from bow to stern. 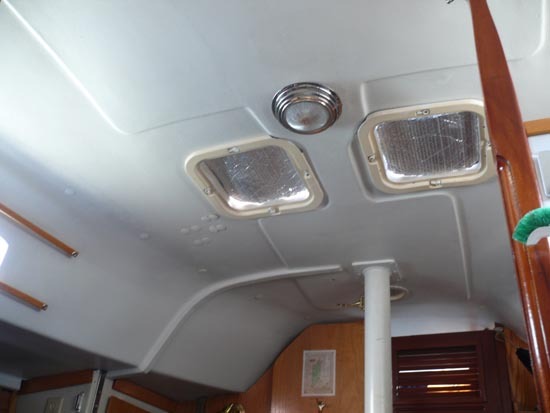 In the bow, one third of the length is taken up by the v-berth and head on port with sink and locker on the starboard side. 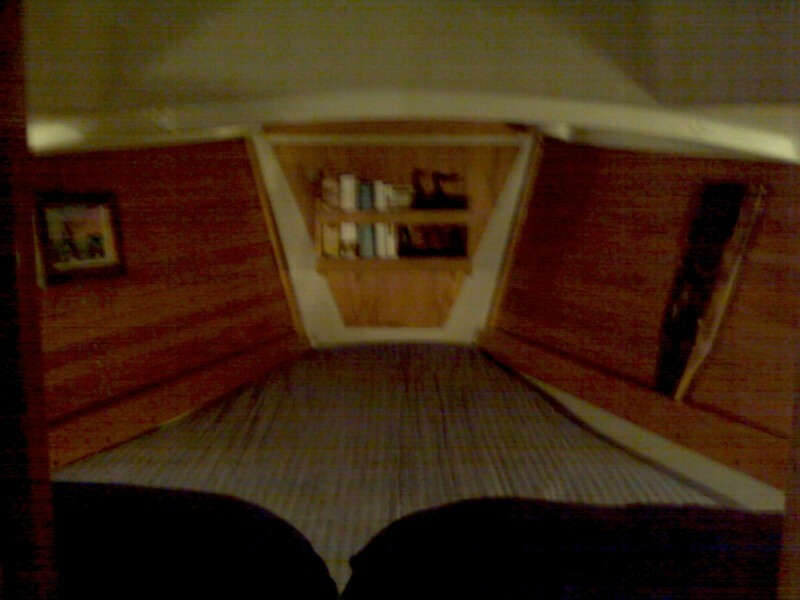 The middle third is the saloon with a table that folds down and settees on either side. This needs to be raised up and everything stowed when a meal is finished. 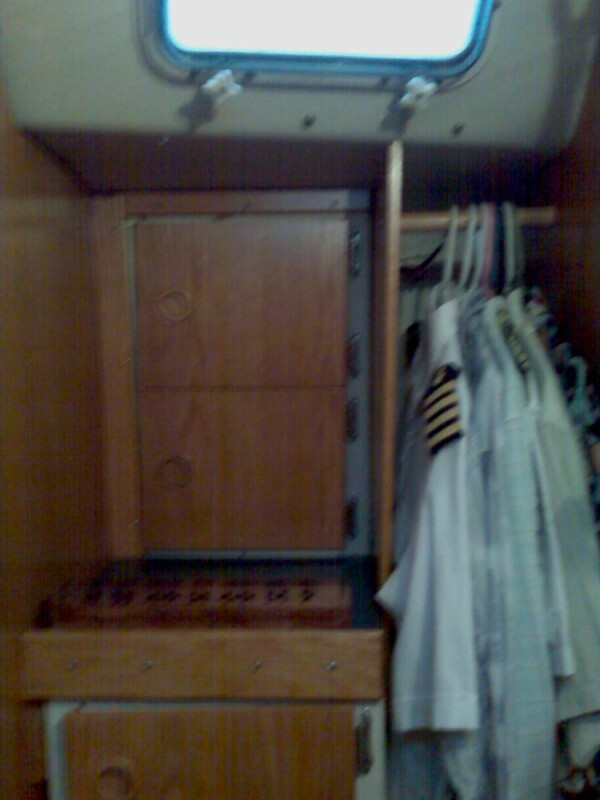 Storage lockers for personal items and clothing are stored behind and below the seats. 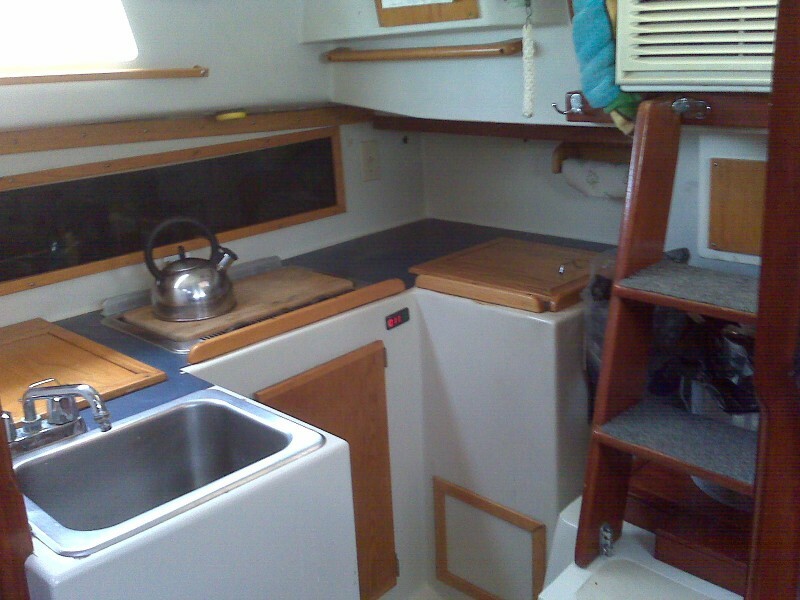 On the starboard side just down the companionway is the galley for one with an ice box I converted to a freezer. 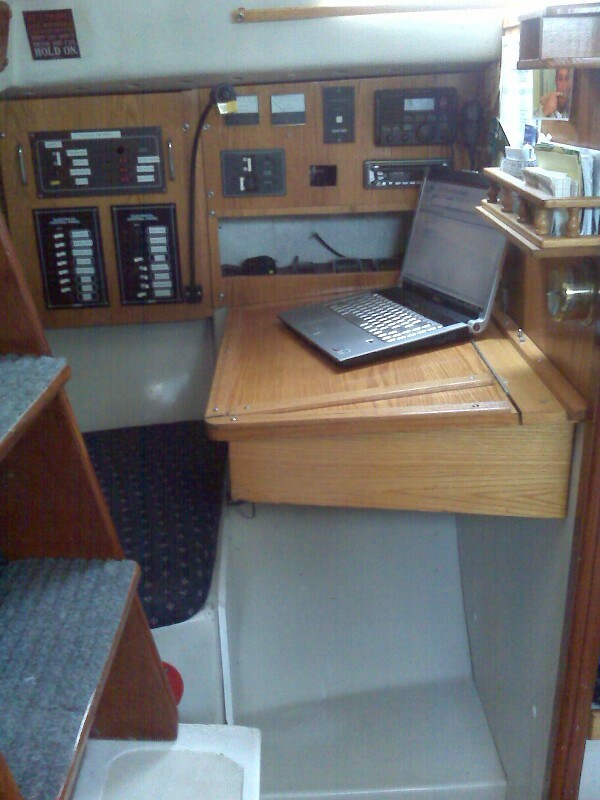 On the port side is a chart table and navigation station. Behind that is a tiny aft berth for crew to rest while underway. 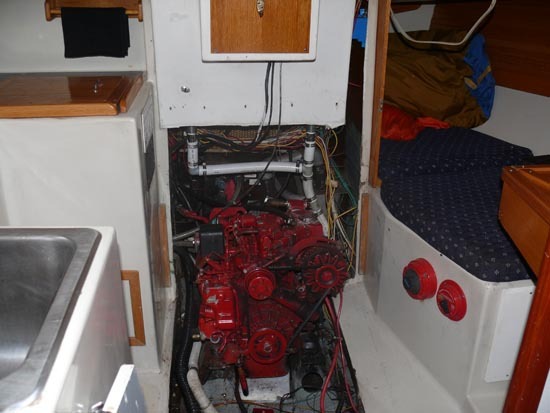 The remaining third of the interior is for the engine room, which is inconveniently located under a bonnet or hood on the interior of the boat, between the galley and the chart table. This was very tight and I had to use mirrors and flashlights to see where to put the screwdriver or wrench when replacing parts. In the stern is the steering linkage and a large locker on the starboard which is accessed from the cockpit above. 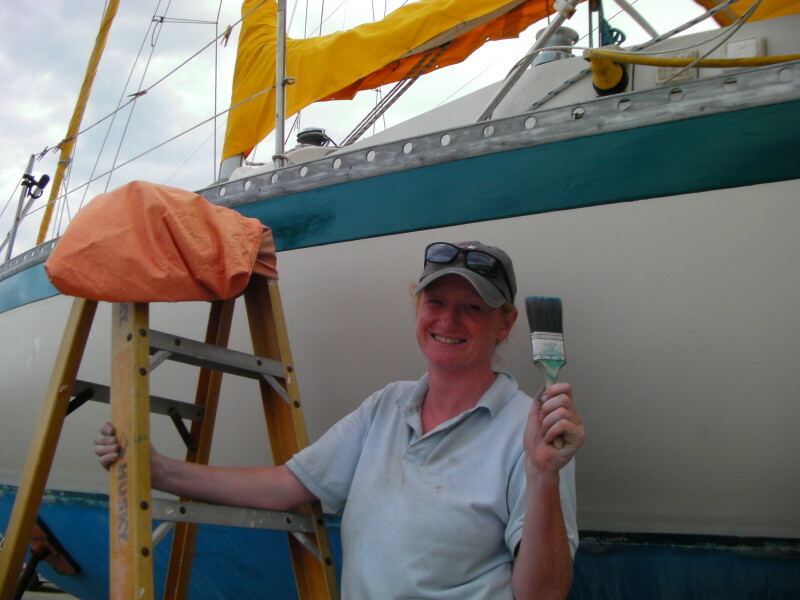 In 2009, when Lindsay and I spent quite a bit of time and money fixing her up and finally sailed away, we got along very well aboard despite the small space. 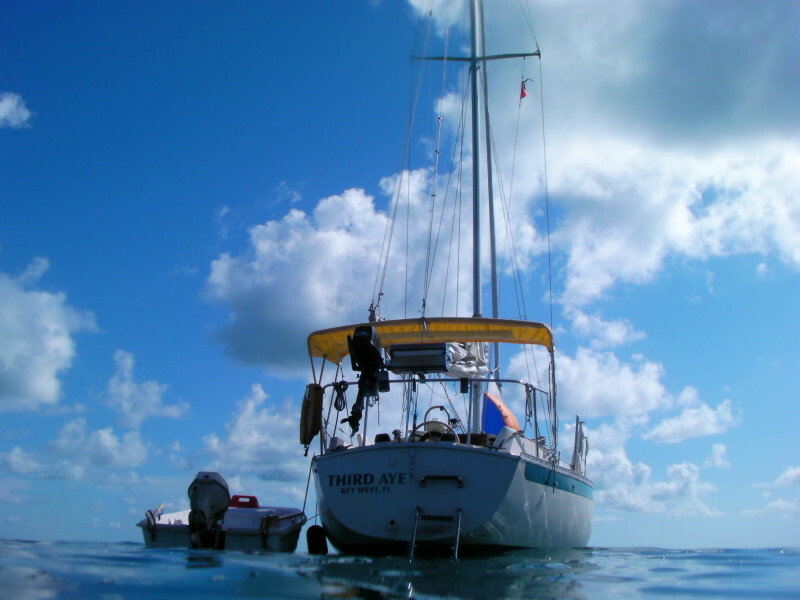 After purchasing the dive shop in 2012, we rented an apartment in Puerto Morelos, Mexico. 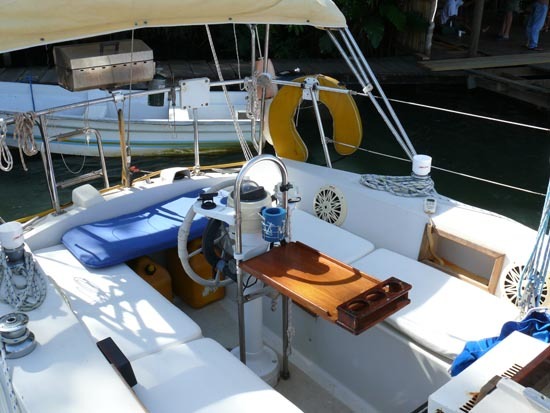 Not living aboard any longer, she was being neglected on a mooring at the El Cid marina, and costing us money. Besides, it was too small for us to use for our future travel goals, and we wanted something larger and safer. We sold her for 10,000 USD, with a clause that she be delivered to Rio Dulce, Guatemala before final payment. That in an of itself is another great fiasco, a good story to tell now about how delivery captains can seriously affect your life. Ask me about it sometime. The next boat we buy, after selling the dive shop, will hopefully be a Leopard 43. 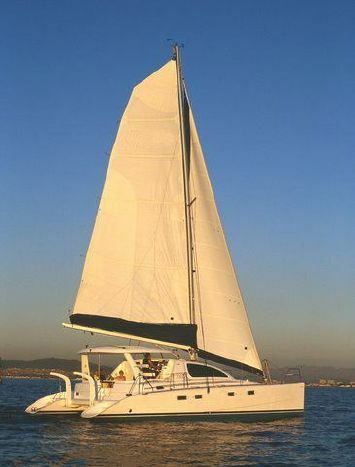 Architect Alex Simonis and builders Robertson & Caine won praise for this catamaran’s speed, windward ability, ease of handling, innovative design features, and phenomenal robustness. The maximum hull speed is 8 knots through the water, if the waves are from behind, in “following seas”, the boat is pushed faster than that over ground. 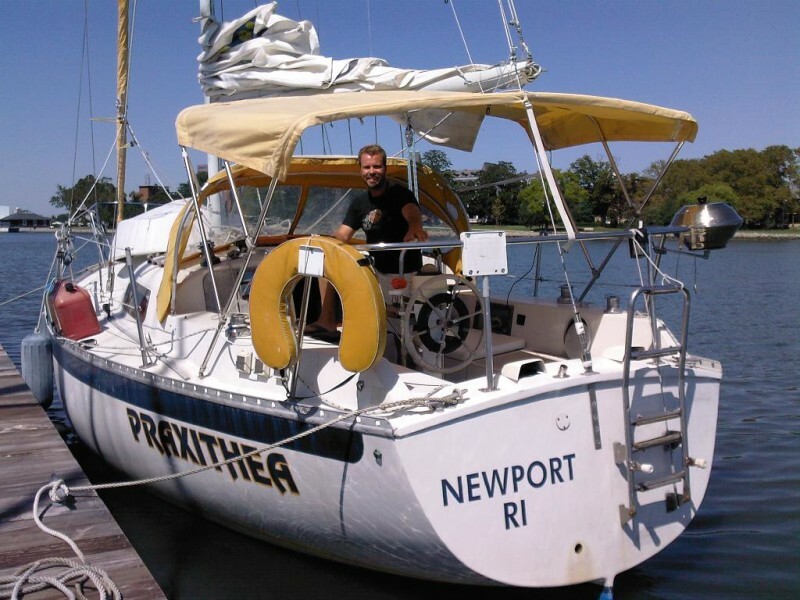 This is over twice as fast as “Third Aye.” They were built with the robust South African standards, received glowing reviews in major sailing magazines, sailed to the Caribbean on their own bottoms, not shipped over. 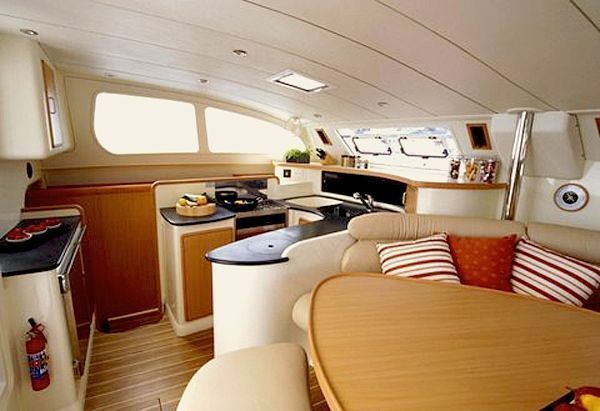 They are a very popular charter boat and currently there are two available right now on Yachtworld.com. I will provide the links to them at the end of this post. 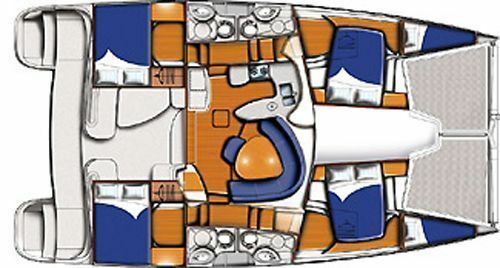 This drawing of the layout with shadowing vividly shows the spacious cabins. 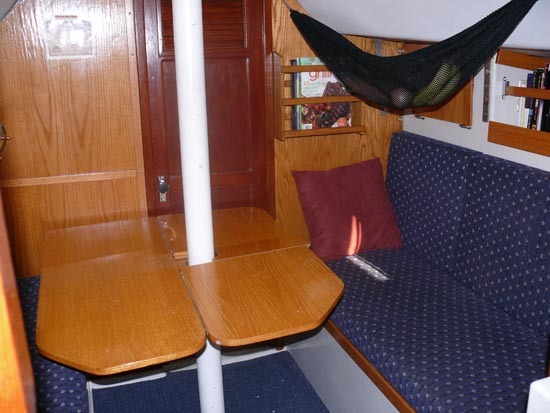 There are four cabins, four queen sized beds, two quarter berths in the forward cabins, and the v-shaped settee in the saloon converts into a double bed. 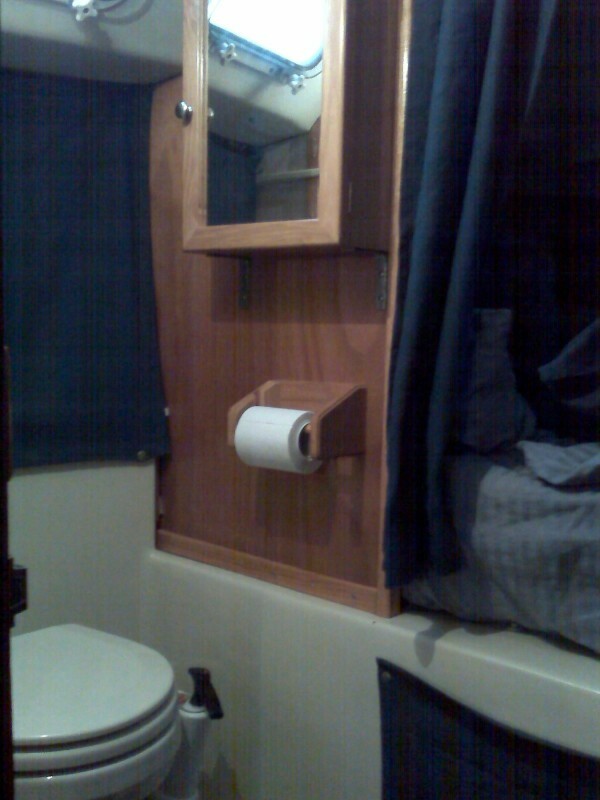 Therefore, this model sleeps up to 8 adults on the queen sized beds, 2 children in the quarter berth, and 2 young adults in the saloon. That’s 12 people on a 43 foot boat, provided everybody packed light in soft luggage. What a layout! There are four bathrooms, or “heads” with showers, and an additional fresh water shower outside at the swim platform. The Leopards are famous for incorporating the cooking space into the dining space, called a “galley up” design. 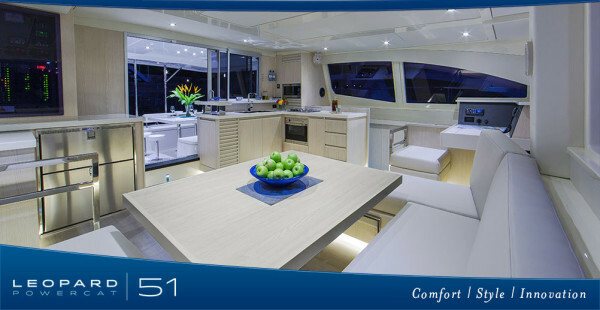 We love this concept of bringing the chef into the room, instead of being trapped in a hallway of one of the pontoons. For dining space, there are two options. Inside for windy or rainy conditions and the v-shaped settee seats 8. 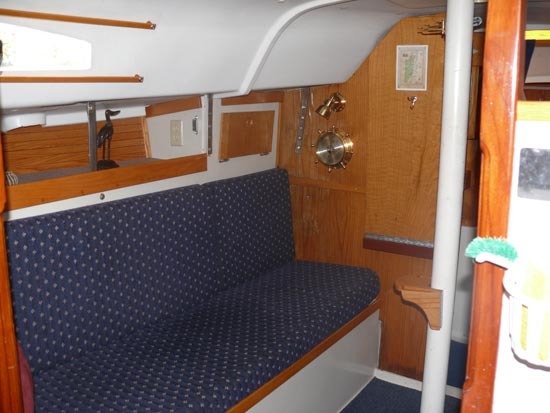 Outside in the cockpit, which is preferrable for cruisers, seats 6 on benches with backs and 2 more on a cooler, with cushions provided for all seats. That’s a total of 16, which is 4 more than can sleep aboard! Again, what a layout! 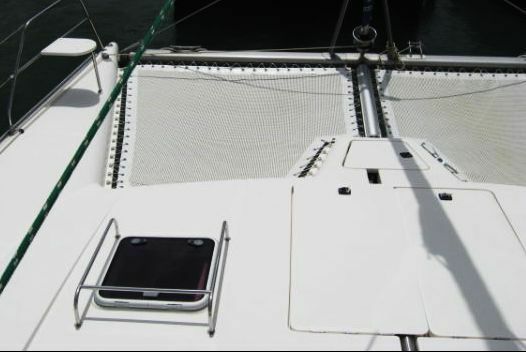 To see more pictures and videos of this boat design, follow this link: 2005 Leopard 43 on yachtworld.com in BVIs. 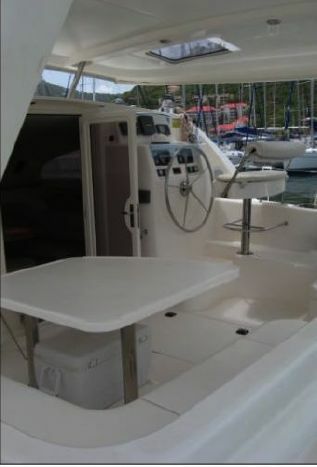 And a second boat for sale here: Another 2005 Leopard 32 on yachtworld.com in BVIs. 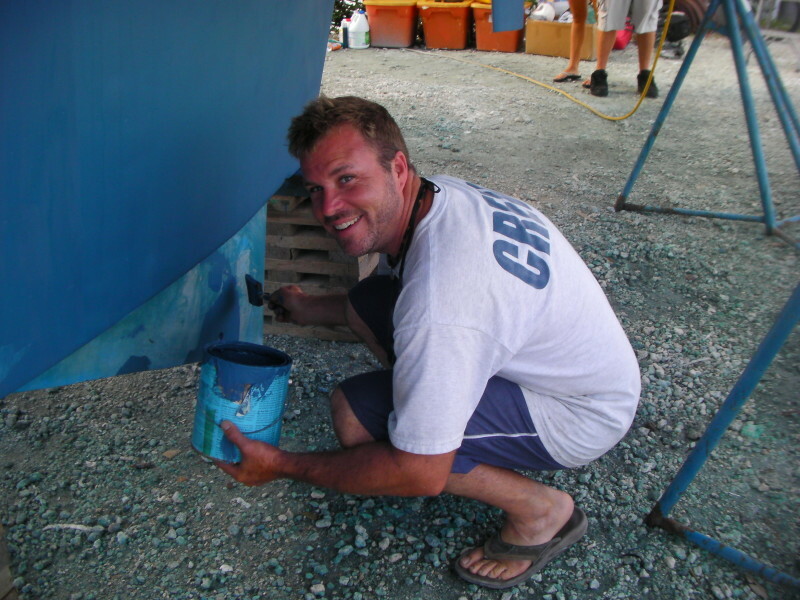 2014 ARC Summary Report – Monohulls are faster? All boats have crossed with a “no news is good news” result. No major problems with the fleet have made the headlines of any sailing magazines or blogs that I have seen yet. Well done by all. Here you can see that a little catamaran called Philocat Ena has reached the harbor in St. Martin well ahead of most boats. Not until we look at the results, which are corrected for handicaps and MOTORING PENALTIES can we determine the finishing order. Philocat Ena has finished second, because they used their motor quite a bit they were not first. Still, impressive to take on an Atlantic crossing on a light catamaran and do it faster than it’s taller competitors. But does that prove that catamarans cross the ocean faster than monohulls? Let’s compare them. They are in two different classes. 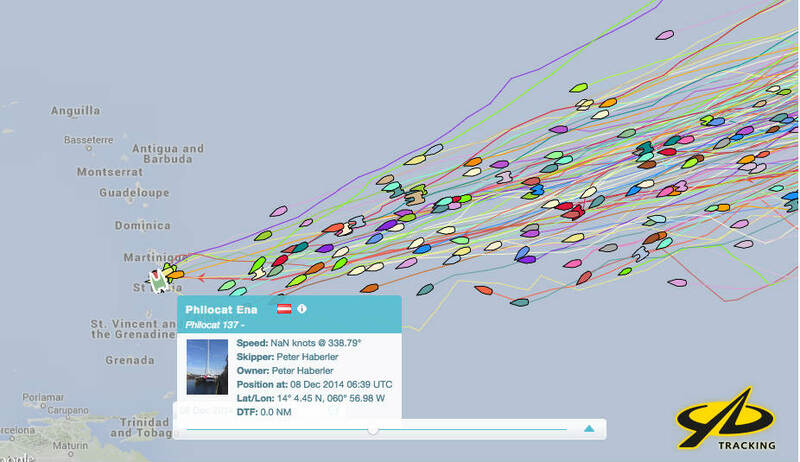 Here we can see the first and second place catamarans finished their crossing in 16 days. Blue Waves actually sailed faster on this crossing than all other catamarans. Well done sailing and maintaining a beautiful boat. And on this table we can see that ten monohulls, some of which are built to go fast, finished before the third place catamaran did, which was in 17 days and a bit. 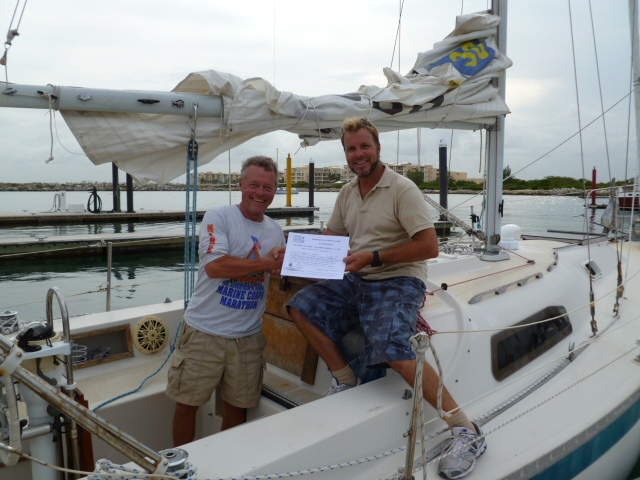 Congratulations to the crusing class monohull winner, Arietta. 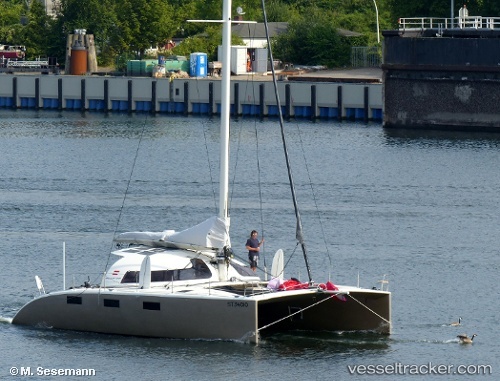 This disproves my theory that all catamarans make crossings faster that monohulls, in general. Nine other monohulls finished before the 3rd place catamaran did. I’m sure some catamarans are faster that some monohulls, such as the Philocat Eno and Blue Waves are faster than most all of the monohulls. However, if we compare all catamarans to all of the monohulls that made this crossing they are not faster. They cats were interspersed among the monos. 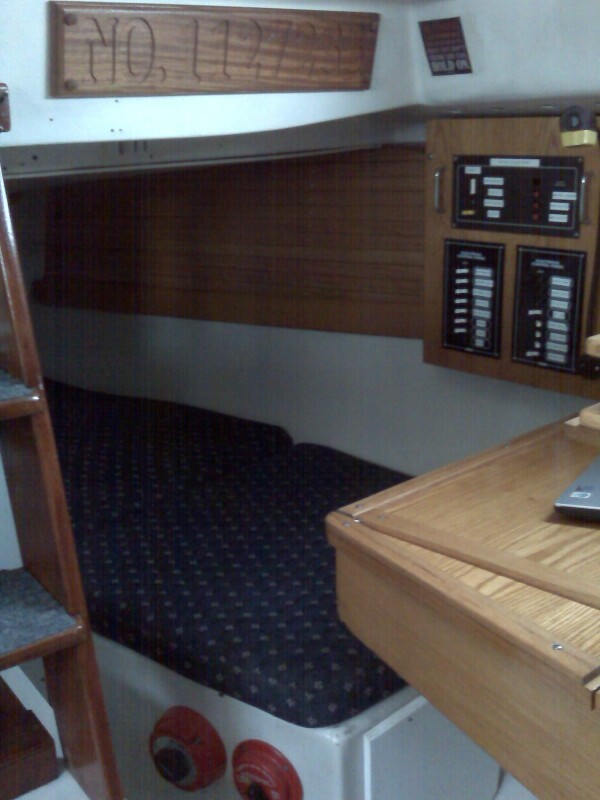 Perhaps it’s the way a catamaran skipper drives his boat, maybe they like to take it easy and don’t like heeling over. It wasn’t a race, after all, it was a RALLY. 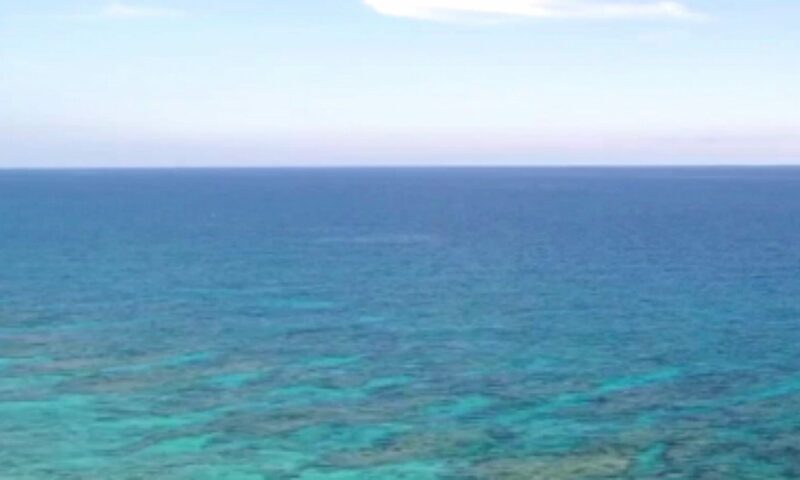 But still, I will attest that a catamaran is more comfortable on anchor than a monohull, which is where Lindsay and I intend to spend most of our time. This is especially true wherever there is motorboat traffic passing the anchorage. 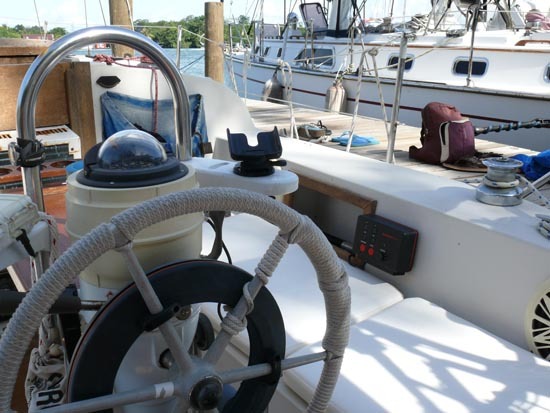 Even small boat wakes from outboard engines tend to “rock the boat” more on a monohull than a catamaran. Tipping over when accidentally going aground will never happen on a catamaran either. What a nightmare that would be! 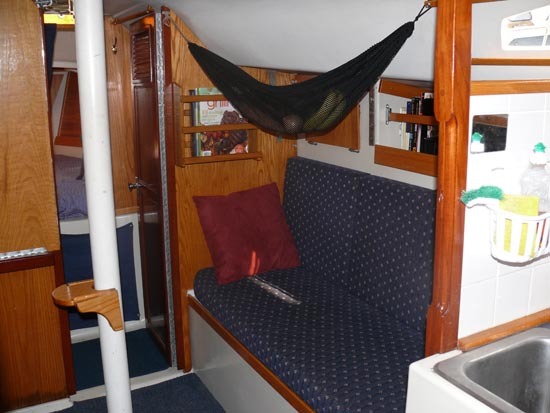 We can all agree that the appeal of chartering a cabin on a catamaran is more attractive than on a monohull, so I think our decision is still sound to purchase a catamaran in the 40-foot-range. Don’t you agree? 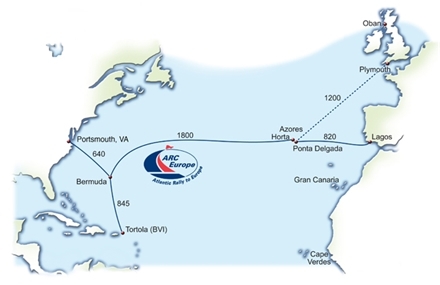 All boats are on their way to Saint Lucia, 2,700 nautical miles to the southwest. The weather provided good north-easterly trade winds for the first few days. After slowing a bit, from 0 to 10 knots, the winds are now expected to shift south of east, improving the speed of those boats that are north of the rhumb line as they can now turn a bit more to the port side, rather then having the wind directly behind them. These boats are all sailing somewhat together and only the racing class can be seen approaching the finish very soon. You can follow them yourself by visiting this site. The ARC crossing record is 10 days, 21 hours, 25 minutes and 10 seconds, set by Caro a Knierim 65 in ARC 2013. This is likely to be under serious threat from 100 foot super maxi Leopard by Finland. 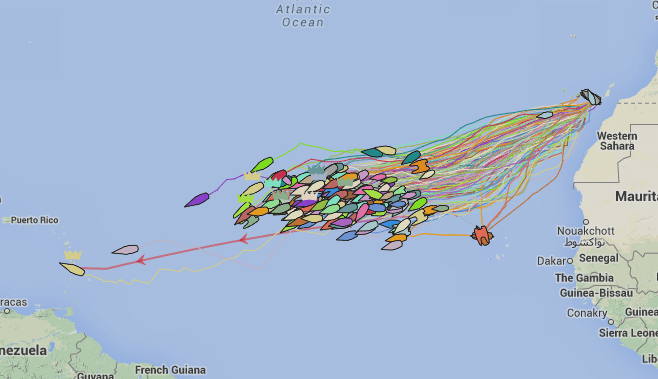 Leopard is sailing with a crew of 23 in ARC 2014, and has a considerable history of conquering Atlantic speed sailing records and is the yellow boat that is shown about to finish the race this evening.